In 2013, I ventured into the hobby of Tablescaping and Blogging. My inspiration came from being a follower of the very popular blog, Between Naps on the Porch (www.betweennapsontheporch.net) and its wonderful creative author, Susan. Little did I know that from that first blog post, I would enter a whole new world of collecting lovely ceramics, dinnerware, centerpieces, glassware, linens, and flatware! But also a world that would lead me to creating a blog, taking my laptop to a whole unknown level of posting, photography and creative writing. Today we celebrate Susan's 500th Tablescape Thursday and at her request to her followers, I'm taking a look back at a few of my blog posts that stand out in my memory for one reason or another. The first table I'd like to share was my very first entry to Tablescape Thursday: http://magichutch.blogspot.com/2013/09/my-first-tablescape_12.html. I remember the efforts to put this post together. Setting the table was not difficult, but steering myself through the production of taking photos, uploading them onto my photoshop program, choosing the photos I wanted and learning how to click and post onto the blog template; then doing the actual linking up were processes that took me HOURS to complete. But, when I became a contributor to my first Tablescape Thursday, I was so proud and happy I kept sharing it with family and friends! This was a special occasion because my roommate from college who lives in NY came for the holidays! Our sunny days in CA had more meaning when we brought in the New Year with a dear friend who has been in my life for 50 years!! Another memorable table was one I created that had as its foundation an unexpected gift from a dear friend. My step-daughter's mother-in-law who hails from France had come for a visit and surprised me with an exquisite tablecloth she had purchased at Versailles! I was humbled by her gift that showed she understood my love of this hobby of tablescaping! One table that brought back sweet memories was the one I did for my dear Dad who passed away when I was just 20 years old. I have many memories of our short time together, especially the times we spent fishing! On his birthday I dedicated a table to him to honor those special trips. It was a heartfelt experience to put this table together. Another favorite table of mine was one that I put together for a challenge from Kathleen at Cuisine Kathleen. She asked her followers to create a table that used white with only ONE other contrasting color. I chose to use white with shades of brown. I enjoyed the challenge, and also enjoyed setting up my table in my living room------just for fun, and in case we wanted to enjoy dinner by firelight! It was fun to go back and see the tablescapes that have brought me so much happiness creating. Thank you, Susan, for your mentorship and enthusiasm that have brought so many of us together to share our love for all the elements that take an empty table and turn it into our own work of art. Congratulations on your 500th Tablescape Thursday! Hey there, Miss Rosie! You chose some goodies! For some reason, though, I thought you’d been blogging a lot longer. 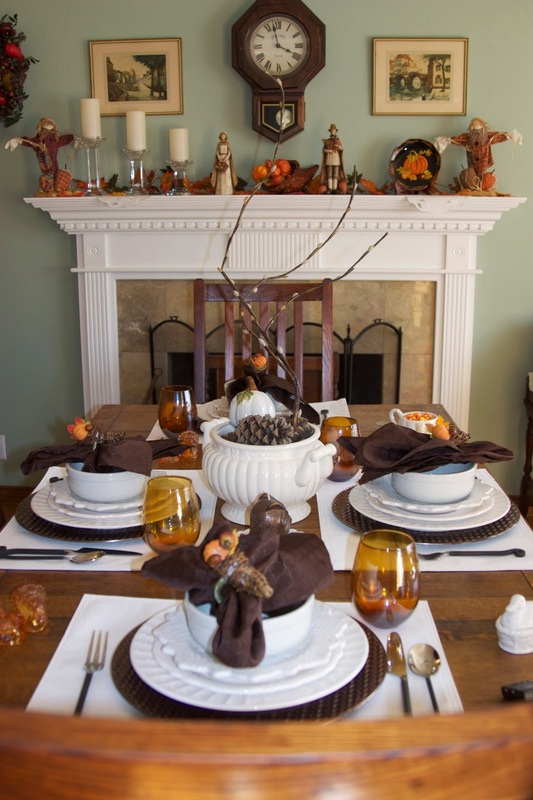 You’ve always presented such well thought out tablescapes with beautiful dishes and accessories. For you to pick out these few had to have been a real chore! I look forward to many, many more in the coming years. Have a safe and happy weekend!!! Rosie, haven't we had fun through the years tablescaping? I believe we started blogging about the same time. Your table settings are always lovely as you use the most beautiful linens and dishes. I, too, took Kathleen's challenge that year but did my table in white and burgundy. What fun! Wishing you a happy weekend, dear friend! Rosie, this is fun. You and I share some a lot of how and why we began blogging, though I began in 2009. Susan was my inspiration! I'm still putting a post together to hopefully share soon. Thanks for visiting my garden post! Hi Rosie, so many lovely tablescapes that you have shared! I couldn’t choose a favorite, because they are all beautiful! Susan is so generous to allow us to share our love for Tablescaping! Happy Sunday, my friend! 500 tablescapes for Susan! Wow! You've done some really beautiful ones Rosie. Fun to look back and see them. hi Rosie, wasn't it fun to participate in Susan's anniversary celebration! So hard to choose and isn't it fun to look back and see how we've changed? I love the ones you picked! This has been fun reviewing everyone's posts for this TT 500th party! I especially love the one your did in memory of your Dad- what a sweet idea. Rosie, these are all so beautiful! Each tablescape is unique, happy and because each holds some significance to your life, they are especially precious!